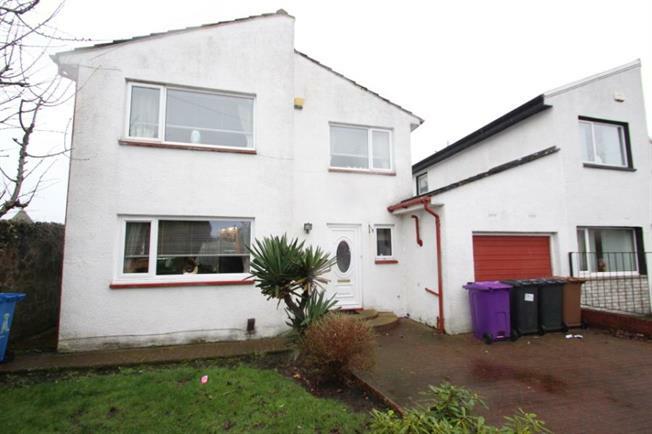 3 Bedroom Detached House For Sale in Irvine for Offers Over £169,000. This extremely well appointed link-detached villa is situated within a quiet residential cul-de-sac in a popular town centre location. Deceptively large in size this beautiful home offers a most spacious layout of flexible accommodation ideal for growing families seeking an impressive home within this sought-after location. The layout briefly comprises of a welcoming reception hall, a cloaks WC, a fine family lounge finished with stylish decor and sitting open plan to the rear facing dining area and a fabulous fully fitted kitchen to the rear with dining/breakfast space. The ground floor is completed with access to the integral garage. On the upper floor access to three double rooms and the superbly appointed family bathroom is gained through a fantastically sized upper hall landing. The size of space of this home is obvious on entry with the lounge opening onto an open plan dining and access to the kitchen which stretches to 23ft at maximum. The lounge is front facing allowing for plenty daylight to fill the room underlining the size to be enjoyed. The dining room sitting to the rear also enjoys natural daylight filling it with sliding patio doors allowing access to timber deck patio and the privately enclosed rear garden. The kitchen provides a great retreat for all the family with space for dining and the fantastic addition of a breakfasting bar - this room truly embraces modern family living and caters for all family and entertaining needs. Completing the lower level is the modern finished cloakroom WC and direct access to the integral garage, providing excellent versatility in intended use, additional storage or the potential to convert into an additional room if required. On the upper level the grand sense of space is continued as the upper landing provides a bright and airy space allowing for access to all upper apartments. The front facing master bedroom is a great size with a recess allowing for a free standing double wardrobe, with this there is adequate space for additional freestanding furniture with no loss to floor space. The two further bedrooms, one front and one rear facing, provide double proportions also. This floor is completed with the truly lavish bath/shower room which provides a Jacuzzi style corner bath and a large shower area. Further benefits to this property are the lower glazing including doors have been replaced within the last 2 years, double glazing, gas central heating. A private well maintained and enclosed garden to the rear mainly laid with lawn areas and enjoying a timber decked patio as well as mature front gardens which can be enjoyed from the front facing lounge. Irvine town centre is easily reached and offers a host of shopping and leisure facilities, bus routes and railway station ensuring that this is a first class location for the family buyer. Local schooling is close at hand with the home being close to and in the catchment of the well regarded The Glebe primary school. EER Band C.